Our 5-axis OP2 system is particularly suited for texturing and micromachining of large 3D shaped objects. Lightmotif builds ultrashort pulse laser micromachining systems. Our focus is on flexible laser micromachining and surface texturing systems intended for research and development or for small scale manufacturing in high-tech job shops, but we are also able to deliver single purpose production machines. Our standard OP2 and OP3 are versatile 5-axis micromachining systems, which also serve as a modular base for semi-custom solutions. We can design and construct a system that fits the requirements specific to your application and intended use. 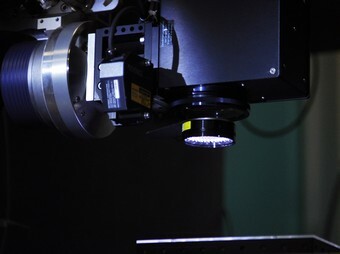 Our systems use a picosecond laser, a 2.5D or 3D manipulator, and a 2D vector scanning system. This combination, together with a tightly integrated control, enables accurate and fast micromachining, also for larger workpieces. Our control software is specifically designed for step-and-scan laser micromachining and allows high-level and machine independent job programming. Jobs are structured (hierarchical) and written in a general purpose object-oriented programming language (Python), making it possible to write very large and complex jobs, or to integrate third-party software. However, if you want to quickly write a script for some simple experiments that's possible too. automate time consuming and error prone tasks such as power measurements and scan field calibration. The use of accurate motion and scanning systems, together with automatic calibration of laser pointing and scanner drift, allows better results that are the same every time. don't promise anything we can't deliver. We have experience in adding application-specific automation and/or machine vision, as well as building automated (single-purpose) production machines. For the development of the (custom) motion subsystem we work closely together with specialized partners. The motion platform for our own 3D research workstation was designed by Q-Sys, an experienced supplier of precision positioning systems. We are currently working on a modular system that will allow us to offer semi-custom machines faster and at a lower price. We expect to have this system available in fall 2014.
let you talk directly to our engineers when you need help/support.